In a prepared statement released earlier this week, Scioto County Sheriff Marty V. Donini said his 911 center received a call at 6:42 p.m. July 2 from a female in the 300 block of Skull Hollow Road in South Webster. The caller stated a male subject ran into her house, pointed a gun at her and told her to get on the floor, then began demanding money. The woman also said the suspect started to sexually assault her when her juvenile daughter heard the commotion and came down the hallway. At that point, the sheriff’s office claimed the suspect shot at the daughter. 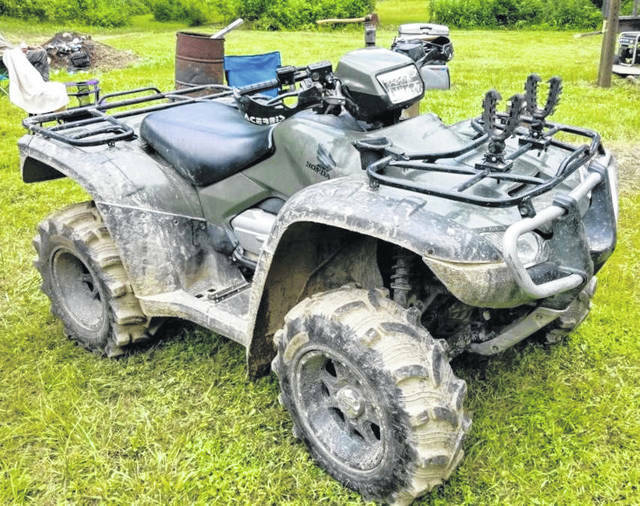 He then fled the scene on a green Honda Forman 4-wheeler allegedly stolen from the victim’s residence. Sheriff’s Capt. John W. Murphy stated the male suspect was described as bald with some facial hair and several tattoos on his body. The male was also said to be carrying a backpack dark in color on his back and had a mask or bandanna attempting to cover his face. Detectives reported later receiving information the suspect had been seen around the hardware store in South Webster on the 4-wheeler. The female victim was transported to Southern Ohio Medical Center by ambulance where she was treated and released. Murphy further stated detectives have been working nonstop on this case talking to several witnesses who believe they spotted the suspect in the area on the 4-wheeler. Evidence was collected at the scene and submitted to the Bureau of Criminal Investigation for processing. On Friday afternoon, Murphy reported to the Daily Times he had no further updates in the case. In his press release, Donini stated this is an ongoing investigation and anyone with information should contact the Scioto County Sheriff’s Office Detective Division at (740) 354-7566. All calls will remain anonymous.